Background: Patient education correlates with adherence since informed patients are more conscious about prescribed medications. The aim of this study is to evaluate the effect of patient education on adherence to antibacterial usage by community pharmacists. Methods: Patients with various infectious diseases, and were prescribed oral antibiotic therapy were divided into two groups: control (CG) and study (IG). Patients were informed about the dose regimen, and were instructed about the drug use. Further oral and visual information about proper use of antibiotics was given to IG. A self-reported, medication-taking behavior scale (MMAS) was used to evaluate patient’s adherence. Results: The groups were homogenous in terms of gender, age and socio-economic characteristics (p>0.05). Most of the prescriptions were written with upper respiratory tract infections by a general practitioner (n=95, 47.7%). There was a statistically significant difference between the two groups in terms of non-adherence rates (p=0.017). There was a significant correlation between adherence and both length of therapy and number of pills in the container (p<0.05). The specialty of physician and information given by the physician did not differ within the groups (p>0.05). Our results showed that, community pharmacist led education on the proper use of anti-bacterial helps to improve patient’s adherence. This study will guide for the creation of educational programs. Antimicrobial resistance is a global healthcare issue which results from irrational use of anti-bacterial and causing ineffectiveness of antibacterial [1,2]. Antimicrobial resistance both in community and hospital settings are mostly correlated with increased morbidity and mortality, and health demands which increase healthcare-costs, hospitalization and ineffective treatment [3-5]. The basic risk factors leading to the development of resistance to anti-bacterial are irrational and/or overuse of anti-bacterial and empirical therapy . One major indicative of effectiveness of treatment is the patient adherence to antibacterial therapy . Different factors determine non-adherence to antibacterial agents, such as dosing regimen, knowledge about anti-bacterial and patient-physician relation. Several studies have discussed the causes associated with non-adherence to anti-bacterial such as attitudes, beliefs, knowledge of antibacterial use [8-10], behaviors [11,12], patients’ perceptions regarding patient-doctor interaction, patient satisfaction, and patients’ experience with anti-bacterial [10-13]. Turkey is among countries in which antimicrobial agents are widely used. Considering pharmaceutical consumption in volume, antibacterial agents are at the first place with 16% ratio in our country, while cardiovascular drugs are at the first place worldwide . Several studies have reported different compliant ratios to antibiotic therapy [15-18]. According to the World Health Organization (WHO) over 40% of prescriptions for anti-bacterial were more or less inappropriate . In our country, however, the rate of adherence in antibacterial therapy is not well known. Educating the public about antibacterial treatment and awareness of antibacterial resistance are thought to influence patients’ demand for antibacterial agent prescription . For this reason, the WHO Strategy for Containment of Antimicrobial Resistance strongly suggests health professionals (physicians and pharmacists) to educate patients on the appropriate use of antibiotics and the importance of completing the treatment . Although many studies were conducted to show the role of community pharmacist in the education of public for the patient adherence to antibacterial therapy , due to the cross-national differences educational interventions should be determined country specific by considering the needs of the population in each country. In line with WHO strategy, Turkey has taken national steps and included the rational medicine use principles into the “2013-2017 Strategic Plan” in which antibacterial agents were given priority. Within the frame of this strategic plan, Turkey published "National Action Plan on Rational Medicine Use 2014-2017" set in adherence with the WHO Strategy for Containment of Antimicrobial Resistance program. This strategic plan involved the following stages: 1. determining the regions on the basis of usage amount and physicians' antibacterial prescribing habits, 2. educating the public and professionals on the rational use of antibacterial in the regions with high and inappropriate use, and 3. subsequent to education, redetermining the antibacterial use ratio, evaluating the decrease in antibacterial agent use ratio and efficiency and/or repetition of education . Correspondingly, in order to develop strategies for local health education purposes, this piloting study was designed to investigate the impact of pharmacists’ educational intervention on the adherence of therapy provided to patients who were prescribed oral antibacterial agents. The fieldwork took place at a community pharmacy in Kars, for four months (January-April). Inclusion criteria were to have a prescription including an oral antibacterial agent, and to have given consent to be followed-up and to answer the questionnaires. Outpatients aged ≥18 were included. Exclusion criteria were to have possible drug interactions between the prescribed drugs and having possible allergic reactions to prescribed antibacterial agents (These patients were re-directed to their doctors). Outpatients under 18 were excluded. The patients were assigned to either the control group (CG), or intervention group (IG). Assignment to groups was carried out by 1:1 randomization. While routine dispensing practice was followed in the CG; the IG patients received educational intervention. Routine dispensing practice was applied to the control group. Briefly, the pharmacist gave CG patients both verbal and written explanations regarding drug usage in accordance with the physician’s recommendations. No additional information was given to this group. In the IG group, however, an educational intervention was implemented after routine verbal and written explanations. According to the WHO suggestions, this group of patients were further informed about; 1) appropriate use of anti-bacterial (taking the anti-bacterial at regular intervals and finishing the course, common adverse effects, such as antibacterial-associated diarrhea, interactions between anti-bacterial and food and/or other medicines), 2) course of the illness, including a realistic recovery time, and 3) common cause and results of antimicrobial resistance . After the completion of educational intervention, a brochure related to the antimicrobial resistance and rational use of antibiotics prepared by the Turkish Ministry of Health within the scope of“National Action Plan on Rational Medicine Use 2014-2017” was distributed to this group (brochure can be found at http://www.akilciilac.gov.tr). Data was collected using a 2-part questionnaire developed from our previous study . While the first part was administered during dispensing theprescribed drugs in the pharmacy, the second part was administered through phone-calls on the last day of therapy. With the first part of the questionnaire following data was collected: 1) socio-demographic information, 2) health center/organization (name, type: private, state or university) 3) specialty of prescribing physician (practitioners or specialists) 4) examination time and diagnosis, 5) prescribed antibacterial agent (name, dosage, number of units delivered, dosing frequency, and the duration of the treatment, if antibiogram for selecting the antibacterial agent was performed), 6) information provided by the physician (the usage, duration of therapy and dosing frequency), and 7) the need of extra information related to issues asked in item 5. In the last day of antibacterial therapy all patients were called for a follow-up interview. Data collected during this interview included: 1) the number of remaining pills in the blister or box, 2) self-report of antibacterial intake (whether they had problems in remembering to take medication on time, forgotten to take medication, stopped taking medication because of either feeling better or worse), 3) self-perceived health condition (whether patient felt much better after the antibacterial therapy. The answers were classified as cured, or not cured)  if drug leaflet was read (only for IG). Phone calls were repeated till all patients were reached. Prescribed antibacterial agents were classified according to anatomical therapeutic chemical classification (ATC) code . For the evaluation of patient adherence to antibacterial treatment, Morisky medication adherence scale(MMAS) was used . The scale is a self-reported, medication-taking behavior scale including four yes/no response questions. The responses are scored with a scoring scheme of “Yes” = 0 and “No” = 1 (Figures1 and 2). The answers are summed to give a range of scores from 0-4: scores <3 indicate low adherence; scores ≥ 3 < 4 indicate medium adherence; and scores=4 indicate high adherence . Figure 1a: Site of infections. Figure 1b: Prescribing ratios of systemic antibacterials (J01). 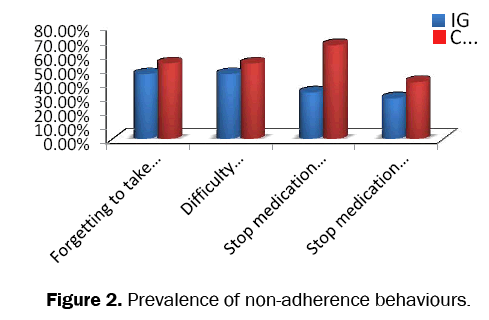 Figure 2: Prevalence of non-adherence behaviours. In this study, none of the interviewed participants reported high adherence on the scale, so the dependent variable of patient adherence was dichotomized into 2 groups: low adherence (scores<3) and medium adherence (scores ≥3) . The statistical package SPSS v.17.0 was used for data analysis. Qualitative variables were expressed as percentages and quantitative variables as mean and standard deviation (SD) values. A value of p<0.05 was considered statistically significant. The Pearson Chi-square and Student t-tests were used to compare qualitative variables. Correlation co-efficiency was calculated using Pearson correlation analysis. Since one of the patients in the IG could not be reached by phone at the follow-up interview, total 199 cases were analyzed (100 IG, 99 CG). The groups were comparable by the socio-demographic and clinical variables (Table 1). Table 1: Socio-demographic and clinical variables of the groups. The mean age of patients was 36.4 years (SD=13.7) in the CG and 32.3 years (SD = 11.7) in the IG. In both groups, the majority of patients were male (56.0% and 67.7% in the CG and IG, respectively). No significant differences in the degree of educational levels were found between the groups (p=0.67). From the 199 prescriptions, 33.6% were prescribed by specialist, 44.7% by general practitioner, and 18.5% by dentist. The doctor’s examination periods were 7.28 min. for the IG and 6.40 min for the CG (p>0.05). Patients were prescribed anti-bacterial for respiratory tract infection (48.7%), dental infection (20.6%), genitourinary system infection (14.5%), and other infections (16.2%) (Figure 1a). Regarding the systemic antibacterial agent (J01) prescription, 45.2% of the patients received beta lactam anti-bacterial-penicillin’s (J01C), 22.6% received other beta lactam anti-bacterial (J01D), 11.5% received quinolones (J01M), and 20.7% received other anti-bacterial. Antibiogram was not performed in any of the patients before prescription (Figure 1b). There were no statistically significant differences in health perception between groups, with reports of being ‘‘cured’’ 52.6% (n=92) in the IG and 47.7% (n=83) in the CG (p=0.32). In the overall population, the rate of low adherence was 38.2% and the distribution was 15.09% and 10.37% in the CG and IG, respectively (p=0.017). Considering the frequency distribution of the MMAS-4 items (Figure 2), there were 35 (46.1%) and 41 (53.9%) patients who had forgotten to take the anti-bacterial in IG and CG, respectively (p=0.412) (Table 2). There was a significant correlation between administration adherence and both length of therapy and number of pills in the container (Table 3). However, examination period did not affect the adherence significantly (Table 3). Table 3: Correlation betweenadministration adherence and length of therapy, number of pills in the container and examination period. Among the 65 respondents who failed to comply with the timing of their dosage schedule, 30 (46.2%) were in the IG and 35 (53.8%) were in the CG (p<0.05) (Table 2). Similar to administration adherence, both length of therapy and number of pills in the container correlated with the timing adherence (Table 4). Table 4: Correlation betweentiming adherence and length of therapy, number of pills in the container and examination period. In total there were 45 patients who stopped taking their anti-bacterial due to “feeling better”; 15 of whom (33.3%) were in the IG and 30 (66.7%) were in the CG, respectively. The difference was statistically significant between the groups (p=0.012). The sub-group analysis of adherent participants yielded no statistically significant differences for age, gender and socio-demographic characteristics (Table 5). Similarly, the specialty of physician and information given by the physician did not differ within the groups (Table 5). Although it was higher in IG, no significant difference was found between the groups for the reading of drug leaflet (42.9% and 57.1% for CG and IG respectively; p>0.05) (Table 5). Table 5: Comparison of the factors that may affect adherence in the sub-group analysis of compliant participants. The adherence rates in patients seeking extra information from the pharmacist were statistically significant between IG and IC groups (p=0.028) (Table 5). Antibacterial agents, with tremendous value to public health, are the most commonly used medications worldwide. Misuse of anti-bacterial during therapy, including failure to complete therapy and skipping of doses, can cause patients to receive suboptimal doses. Such antibacterial taking behavior can result in insufficient antibacterial exposure for eradicating infectious bacteria and subsequently can create antibacterial resistance. For this reason, the WHO has launched a program to fight against the development of antibacterial resistance . In line with this program Turkey has prepared "National Action Plan on Rational Medicine Use 2014-2017". Within the frame of this action plan, “Antibacterial Drug Consumption Surveillance” report is the very first step taken to collect comprehensive data on national antibacterial use . In the report, in accordance with the standardized methodology proposed by WHO (Anatomical Therapeutic Chemical-Defined Inhabitant Dose; ATC-DID) of all antimicrobial drugs systemic anti-bacterial (J01) with 42.28 DID use is in the first place in ambulatory patients. In the DID distribution of the ATC-3 level of this group beta-lactam anti-bacterial, penicillin’s (J01C) have been identified as the most used antibacterial agents, followed by other beta-lactam anti-bacterial (J01D), macrolides and lincosamides (J01F) and quinolones (J01M). In our study, we found similar prescription rates. In the report the distribution of regional consumption (Nomenclature of Territorial Units for Statistics, NUTS) of J01 group agents was also shown. In Kars, which was the center of our study, the reported distribution of regional consumption was 28.42 DID, which was lower than the average consumption in Turkey . The same report displayed significant regional differences in the consumption of anti-bacterial, which needs further consideration. In their study comparing findings from 17 countries, Versporten reported that in antibacterial consumption Turkey takes the first place not only among the countries compared but also among ESAC-Net (European Surveillance of Antimicrobial Consumption Network) countries . According to the same study, Turkey's antibacterial DID value is about 3.5 times higher than that of the Netherlands which is an ESAC-Net country with the lowest DID value . These results indicate that Turkey must to take urgent steps for rational use of anti-bacterial. The present study estimates that nearly 38.19% of the patients in this sample were non-adherent with antibacterial treatment. Different estimates were reported in the literature [31-33]. This may be due to different definitions and measures of non-adherence. In a systematic review on antibacterial misuse, Kardas and colleagues  reported that subjective methods had been used for measuring adherence in 67.2% of all the studies, and compared to objective methods the ratio of adherence was higher (66.0% vs. 55.6% respectively). The alpha reliability was validated as 0.61 for MMSA-4 . A meta-analysis and a Cochrane review found interventions carried out by health professionals (physicians) to be effective on treatment adherence [34,35]. However, especially in countries with high patient number per physician daily as in the Turkish context, physicians do not allocate sufficient time to the patients in clinical practice due to workload. In our study examination times were 7.28 and 6.40 minutes in IG and CG, respectively. Alongside the short examination times, we could not find any significant correlation between information given by the physician and adherence. According to us, both findings need to be evaluated with caution. In order to solve the excessive antibacterial consumption problem in Turkey, well before educating the public by physicians, we should consider the physicians’ general knowledge, attitude and treatment behaviors about antibacterial prescription, and identify the prescription errors (wrong diagnosis, dosage, dose regimen and length of therapy) done in practice. Studies in literature support this argument [36,37]. Indeed, although physician behaviors were not studied in our study, we observed that antibiogram was not performed to any of the patients before prescription. Similarly, in their study evaluating family physicians’ knowledge, attitude and treatment behaviors about anti-bacterial, Parlak reported that physicians who studied treatment guidelines of anti-bacterial had a good level of knowledge on rational antibacterial use and correctly treated their patients . Our study results revealed that implementing an educational intervention when patients come to a pharmacy to collect their prescribed anti-bacterial increases adherence to the treatment. The educational intervention in this study was effective, with an 18.8% difference in adherence between the CG and IG. In the perspective of pharmaceutical interventions the results are controversial [39,40] and it is difficult to identify an overall successful strategy-improving adherence performed by pharmacists. In the literature improved adherence was reported, yet the differences in some studies were not statistically significant [10,18,41,42]. This can be explained with the type of intervention. Compared to intervention with written information, oral interventions are close and accessible to the patient . In our study both oral and written information was given and this educational intervention was supported with visual materials as well. Different studies showed a relationship between health as perceived by patients and their adherence to treatment [18,43]. However, in our study we found no significant differences between groups with regard to patient-perceived health. This might result from our way of measuring the perceived health through a single direct question to the patient. Thus, the results need to be interpreted with caution. Previous studies showed that patient-related variables are associated with adherence. Increasing age is also associated with a decreased risk of non-adherence [3,44]. However, we could not find statistically significant correlation between the age and patient adherence. In our study, mean age in IG was lower than CG. Non-adherence ratio was also found lower in IG. Additionally, in sub-group analysis of IG (according to age; ≤30 and >30) no statistically significant difference was found between groups. Similarly, we found no significant difference in the sub-group analysis of CG. According to Fernandez  satisfaction with the information given by the physician (regarding the antibacterial agent) diminishes the odds of non-adherence by 67%. Munoz  showed positive correlation with medication knowledge and medication adherence. Similarly, in our study 51.2% of the participants declared need for more information about the medication. Therefore, it can be concluded that increase in knowledge about the medication positively effects adherence to the therapy, and educating the patient regarding the appropriate use might be an implicit strategy for improving adherence. And this can be achieved by encouraging community pharmacists to take a proactive role. In order to improve the adherence of patients who forgot to take their medications, several interventions, including patient education, packaging and reminder devices, have been designed. Although patient education is the most traditional method, it is found to be the most effective method . In our study, difference between non-adherence ratios of the two groups was not statistically significant (53.9% and 46.1% for CG and IG, respectively (p=0.412) (Table 2). For further improvement in the adherence, some simple tips, such as setting an alarm, taking of drug with meals (if possible), combining with routine tasks like tooth brushing can also be suggested to the patients. Moreover, some tools such as electronic reminder pill bottle caps and/or boxes can be suggested. However, they have reported to meet with limited success in improving adherence . Regarding the adherence to the timings of the dosage schedule, the observed non-adherence rates were almost the same as the non-adherence resulting from forgetfulness (53.8% and 46.2% for CG and IG, respectively) (Table 2). This strengthens our argument that patient education about the proper use of drug improves antibacterial adherence. Here, we have to point out that the difference between the groups were not statistically significant (p=0.480). This was most probably resulted from the basic verbal and written information that the pharmacist is ethically obliged to give to the patients in CG. Patients frequently tend to discontinue antibacterial therapy, when they begin to feel better or when adverse events occur [47,48]. A similar tendency was observed in our study population. There were a total of 45 respondents who stopped taking their anti-bacterial because of “feeling better”. This is the most important indicator of poor antibacterial agent-taking behavior, and it can be reversed only by patient education. Indeed, in our study, compared to CG, discontinuation to the therapy due to feeling better were almost two-fold lower in the IG (66.7% vs. 33.3%; p=0.012). Discontinuation of the antibacterial therapy is the main reason of leftover drugs. Patients-especially in countries that require pre-packaged doses of medication as in Turkey-tend to retain the pills for future use [25,49]. This results in off-label use of anti-bacterial, such as using anti-bacterial for the upper respiratory tract infections, which are not bacterial infections [18,50]. Patients should be educated in not using the leftover anti-bacterial without consulting to a health professional after the completion of the prescribed regimen. As a conclusion, non-adherence to antibacterial therapy was common among patients referring to community pharmacies. This case was due to two main reasons: forgetfulness and failure to comply with timing. Pharmaceutical intervention increased patient adherence to antibiotic therapy. In this study, statistically significant increases in adherence rates in patients who asked for extra information from the pharmacist strongly support this argument. There is no doubt that community pharmacist play a key role in the rational use of antibacterial agents. Community pharmacist’ intervention on patient’s education is not only effective, but also feasible and compatible with the rest of the activities in community pharmacy. When the results of this pilot study are evaluated within the scope of “National Action Plan on Rational Medicine Use 2014-2017”, nationwide education programs addressing regional needs should immediately be launched. These education programs must be designed separately both for healthcare professionals and public. The education for the professionals-physicians should specifically be offered as postgraduate update programs on regular basis and the physicians should be informed about the current guidelines on rational use of antibacterial. The education for the professionals-community pharmacists should designed in coordination with the trade bodies like Turkish Pharmacists’ Association and academicians. By these programs, public will be accurately and adequately informed about the rational use of antibacterial. Moreover, public will also be provided standardized audio-visual informative materials. To our knowledge, this study is the first national pilot study, and we believe that our findings will guide the prospective educational programs. This study was approved by the Yeditepe University Clinical Research Ethic Committee. The participants were informed about the objective and the method of the study and they were accepted to consent if they filled out the questionnaire form. Part of this study was conducted as MSc thesis in Clinical Pharmacy Department of Yeditepe University, Faculty of Pharmacy. Questionnaires will be made available upon request from S. Gunes except identifying/confidential patient data. SSG, PMCconceived and designed the study, SSG, CM and NT coordinated the data collection, analyzed the data, interpreted the data analysis, drafted the manuscript, GM revised the manuscript critically for important intellectual content. The authors would like to express their sincere thanks to all participants for their support in this study. European Centre for Disease Prevention and Control. Antimicrobial resistance surveillance in Europe 2011. Annual Report of the European Antimicrobial Resistance Surveillance Network (EARSNet). Stockholm: ECDC; 2012. ISBN 978-92-9193-398-3. Goossens H, et al. ESAC Project Group. Outpatient antibiotic use in Europe and association with resistance: a cross-national database study. Lancet. 2005;365:579-587. Pechere JC, et al. Non-adherence with antibiotic therapy for acute community infections: a global survey. Int J Antimicrob Agents. 2007;29:245–253. Pérez-Trallero E, et al. Antimicrobial resistance among respiratory pathogens in Spain: latest data and changes over 11 years (1996-1997 to 2006-2007). JAntimicrobChemother. 2010;54:2953-2959. Shehan B, et al. Emergency department visits for antibiotic-associated adverse events. Clin Infec. Thomas DW, et al. Antibiotic prescription for acute dental conditions in the primary care setting. Br Dent J 1996;181:401-404. Kardas P. Patient adherence with antibiotic treatment for respiratory tract infections. J AntimicrobChemother. 2002;49:897-903. Awad A, et al. Self-medication with antibiotics and antimalarials in the community of Khartoum state, Sudan. J Pharm Sci. 2005;8:326-331. Chan G and Tang SF. Parental knowledge, attitudes and antibiotic use for acute upper respiratory tract infection in children attending a primary healthcare clinic in Malaysia. Singapore Med J. 2006;47:266-270. Mitsi G, et al.Patterns of antibiotic use among adults and parents in the community: A questionnaire-based survey in a Greek urban population. Int J Antimicrob Agents. 2005;25:439-443. Al-Azzam SI, et al. Self-medication with antibiotics in Jordanian population. Int J Occup Med Environ Health. 2007;20:373-380. Sarahroodi S, et al. Antibiotics self-medication among southern Iranian university students. Int J Pharmacol. 2010;6:48-52. Crossley J, et al. Children and their parents assessing the doctor–patient interaction: a rating system for doctors’ communication skills. Med Educ. 2005;39:820-828. Gil V, et al. Non-adherence of the treatment with antibiotics in non-severe acute infections. Med Clin (Barc). 1999;112:731-733. Llor C, et al. Adherence rate of antibiotic therapy in patients with acute pharyngitis is very low, mainly when thrice-daily antibiotics are given. Rev EspQuimioter. 2009;22:20-24. Branthwaite AR and Pechère JC. Pan-European survey of patients’ attitudes to antibiotics and use. J Int Med Res. 1996;24:229-238.
WHO Global Strategy for Containment of Antimicrobial Resistance. 2001 at 2012. Vanden Eng J, et al. Consumer attitudes and use of antibiotics. Emerg Infect Di 2003;9:1128-1135. Deschepper R, et al. Are cultural dimensions relevant for explaining cross-national differences in antibiotic use in Europe? BMC Health Serv Res. 2008;8:123. Goktay NB. The role of patient education in adherence to antibiotic therapy in primary care. Marmara Pharm J. 2013;17: 1-7. Munoz EB, et al. The effect of an educational intervention to improve patient antibiotic adherence during dispensing in a community pharmacy. AtenPrimaria. 2014;46:367-375.
WHO. Collaborating Centre for Drug Statistics Methodology. Guidelines for ATC classification and DDD assignment, 2013. Oslo, 2012; ISBN: 978-82-8082-525-4. Morisky DE, et al. Concurrent and predictive validity of a self-reported measure of medication adherence. Med Care. 1986;24:67-74. Menditto E, et al. Self-Assessment of Adherence to Medication: A Case Study in Campania Region Community-Dwelling Population. J Aging Res.2015:682503. Versporten A, et al. WHO/Europe-ESAC Project Group. Antibiotic use in Eastern Europe: a cross-national database study in coordination with the WHO Regional Office for Europe. Lancet Infect Dis. 2014;14:381-387. Kardas P, et al. A systematic review and meta-analysis of misuse of antibiotic therapies in the community. Int J Antimicrob Agents. 2005;26:106-113. Pechere JC, et al. Non-adherence with antibiotic therapy for acute community infections: a global survey. Int J Antimicrob Agents. 2007;29:245-253. Fernandes M, et al. Non-adherence to antibiotic therapy in patients visiting community pharmacies. Int J Clin Pharm. 2014;36:86-91. Peterson AM, et al. Meta-analysis of trials of inter-ventions to improve medication adherence. Am J Health Syst Pharm. 2003; 60:657-665. Akici A, et al. Prescribing habits of general practitioners in the treatment of childhood respiratory-tract infections. Eur J Clin Pharmacol. 2004;60:211-216. Leblebicioglu H, et al. Physicians' antibiotic prescribing habits for upper respiratory tract infections in Turkey. J Chemother. 2002;14:181-184. Parlak E, et al. Rational Antibiotic Use Among Family Physicians: A Cross-Sectional Study from Erzurum. Euras. J Fam Med. 2013;2:27-32. Clark PM, et al. Effect of pharmacist-led patient education on adherence to tuberculosis treatment. Am J Health Syst Pharm. 2007;64:497-505. Morgado MP, et al. Pharmacist interventions to enhance blood pressure control and adherence to antihypertensive therapy: review and meta-analysis. Am J Health Syst Pharm. 2011;68:241-253. Machuca M, et al. The effect of written information provided by pharmacists on adherence with antibiotherapy. Ars Pharmaceutica 2003;44:141-157. Andrés JC, et al. Assessing pharmacist intervention on antibiotic therapy adherence. Seguim. Farmacoter. 2004;2:97-102. Rodríguez MA, et al. Influence of sociodemographics and clinical characteristics in the adherence of pharmacological treatment of patients with cardiovascular risk. Pharm. Care Esp. 2012;14:138-145. Kardas P, et al. A global survey of antibiotic leftovers in the outpatient setting. Int J Antimicrob Agents. 2007;30:530-536. Cunha BA. The importance of adherence with oral antibiotic regimens. Adv Ther. 1988;5:297-305. Checchi KD, et al. Electronic Medication Packaging Devices and Medication Adherence A Systematic Review. JAMA. 2014;312:1237-1247. Pechere JC. Parameters important in short antibiotic courses. J Int Med Res. 2000;28:1:3A-12A. Hawkings NJ, Butler CC,Wood F. Antibiotics in the community: a typology of user behaviours. Patient Educ Couns. 2008;3:146-152. González J, et al. Storage of antibiotics in Spanish households. Rev EspQuimioter. 2006;19:275-285. McKee MD, et al. Antibiotic use for the treatment of upper respiratory infections in a diverse community. JFam Pract 1999;48:993-996.